Love playing Brick breaker game? Check out the latest block breaking game – Ben 10 Blockade Blitz! Help Ben 10 to kill the monster aliens hiding behind the wall of blocks. Use powers of Omnitrix and your skills to hit the blocks with the omniball. 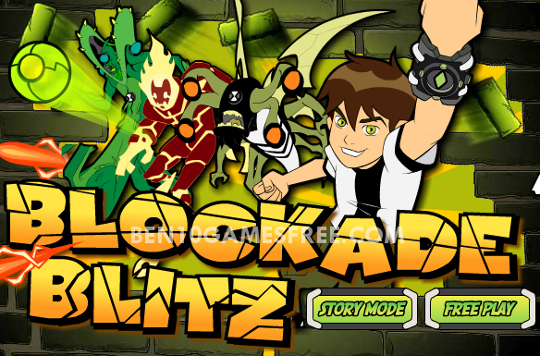 Ben 10 Blockade Blitz is created keeping in mind the retro-styled block breaking game and replicating them for ben 10 fans. The basic concept is same but there are a number of twists in the game. The challenge is to kill the aliens cannot be killed without destroying the wall around them. Kill the all monsters to clear the level and move to the next block level. If you have played any of the block breaking games earlier, then Ben 10 Blockade Blitz is going to be a cakewalk for you. For those who are playing this for the first time, let me explain for them. Ben 10 is standing on one side of the block wall and there are evil aliens on the other side of the wall. You have to hit these balls using the green ball. If the ball drops, you will lose a life, so, be careful. Once all the blocks are broken, you can kill the aliens. Pro Tip: Collect the Aliens badges that fall to transform Ben into that Alien. There are two modes in which you can play Ben 10 Blockade Blitz game online. Choose any of the modes and begin playing this amazing ben 10 block game. Destroy the blocks wall and kill all the monsters to win. Good Luck!! Don’t Forget to give your rating for Ben 10 Blockade Blitz game and share your tips and tricks to win this game in the comments section below.